There's beauty in community history, and we're honored to be a part of the team that's re-imagining and redesigning Larkinville one brick at a time! To celebrate the construction of the new AP Lofts at 545 Swan Street, there will be a groundbreaking ceremony on September 6th. 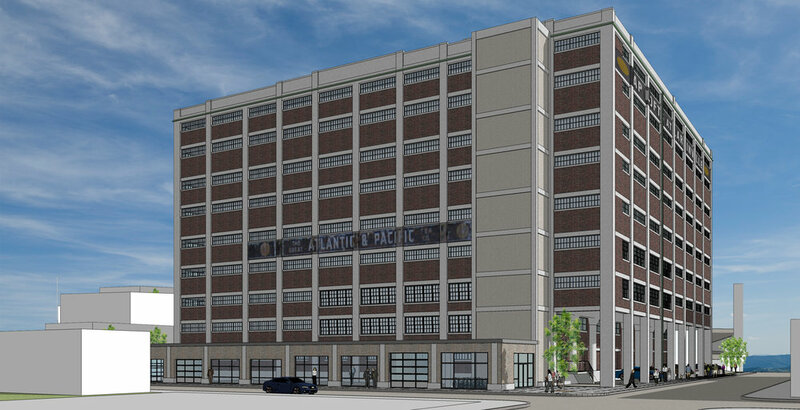 The AP Lofts is a mixed-use historic adaptive re-use project, delivering modern loft style apartments at the site of the former Atlantic & Pacific Tea Company warehouse that was built in 1910. Partnering with KCG Development and RP Oak Hill Development, we're creating 147 apartments with two stories of interior mezzanine parking within the existing envelope of this historic property. We're thrilled to be partnering with Pegula Sports and Entertainment, McGuire Development, and Labatt USA to bring the redevelopment of 79 Perry Street Hi-Temp building to life in Buffalo's Cobblestone District! This circa 1920 building previously served as a warehouse for the Flickinger Co., a local supermarket operator. Plans call for Labatt USA's corporate headquarters and restaurant/brewery on the first two floors, corporate offices for the third and fourth floors, and apartments for the sixth floor. We are seeking state and federal historic tax credits to help finance the project. This project serves as a major key development bridge between Canalside and Cobblestone Districts! Buffalo Business First details here. We were honored to partner with Natale Development on the conversion of this 100 year old warehouse into a residential space! The Crescendo lofts has been approved by the NYS Historic Preservation Office for inclusion on the National Register of Historic Places! The Preservation League of New York State has selected the Phoenix Brewery Apartments in Buffalo to receive an award for Excellence in Historic Preservation. The League's statewide awards program honors notable achievements in retaining, promoting and reusing New York State's irreplaceable architectural heritage. This is the 6th time CWM has won this prestigious award for their work. "Built in 1888 as a brewery, this building has already risen from the ashes once, when a fire destroyed more than half the structure and it earned its moniker 'Phoenix Brewery'," said Jay DiLorenzo, President of the Preservation League. 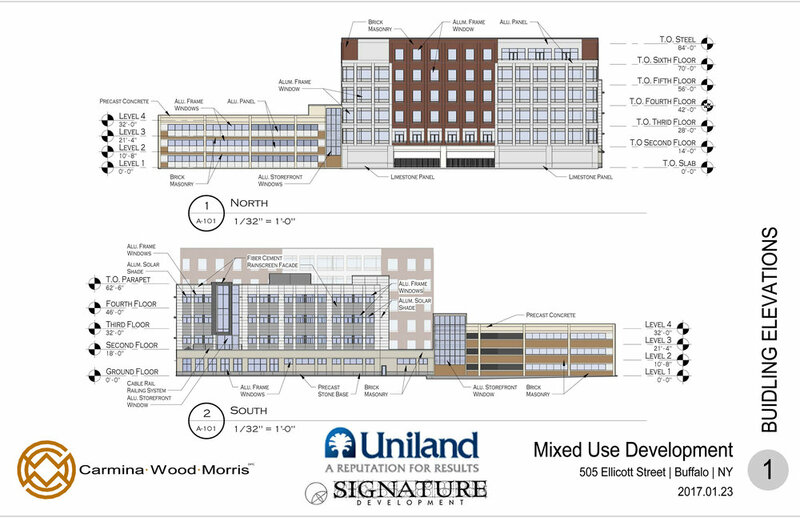 "This project has transformed a vacant building and is the first market-rate residential development in the Buffalo-Niagara Medical Campus neighborhood. Meticulous restoration of the building's brick and sandstone masonry, replacement of the lost central "crown" of the structure's cornice, and sensitive interior work earned the approval of the National Park Service and State Historic Preservation Office, facilitating the use of Historic Preservation Tax Credits." The project team included Jonathan Morris and Joseph Dorobiala of Carmina Wood Morris; Nick Sinatra, Matt Connors, Cole Hatley, and Tim Spitler of Sinatra and Company Real Estate; Donald Guize, IBC Engineering PC; and Lauri Traynor, Studio T3 Engineering.. The project used State and Federal Historic Preservation Tax Credits. In 2014, Sinatra and Company Real Estate announced plans for a mixed-use redevelopment of the Phoenix Brewery. The building's rebirth includes 3,000 square feet of commercial space and thirty-one unique, luxury loft apartments with exposed brick accents, tall ceilings, polished concrete floors and high-end finishes. Containing 15 one-bedroom and 16 two-bedroom units ranging in size from 714 square feet to 1,314 square feet, each has a unique layout and several have second level loft areas. Carmina Wood Morris, DPC was retained by Sinatra & Co. to design the structure's reconstruction and restoration, securing Historic Preservation Tax Credits necessary to fund the project's implementation. Sinatra is donating ten percent of project profits to Say YES Buffalo, a community education collaborative aimed at increasing high school and post-secondary completion rates. "This recognition is so rewarding because we had several specific challenges to overcome," said Joe Dorobiala of Carmina Wood Morris. "We're proud to work with enlightened development partners who allow us to bring forth our special expertise to keep Buffalo's historic past alive." The awards will be presented at the Preservation League's Awards Ceremony in New York City at 6:00 p.m. on Wednesday, May 10th at the historic New York Yacht Club, 37 West 44th Street. The complete list of award winners is: Phoenix Brewery Apartments, Buffalo; Beekman Hotel and Residences/Temple Court, New York City; A. Philip Randolph Houses, Phase One, New York City; South Street Seaport Museum: the 1885 sailing ship Wavertree, New York City; Rouge Tomate Chelsea, New York City; Marriott Syracuse Downtown (formerly Hotel Syracuse); Pickens Hall & Opera House, Heuvelton; Argos Inn, Ithaca. Ruth Pierpont, the former Deputy Commissioner for Historic Preservation and the Deputy State Historic Preservation Officer, will be honored for decades of service to the cause of historic preservation in New York State. "With our annual awards program, the Preservation League explores not just the present, but the future of historic preservation. Many of the 2017 award winners provide valuable examples for others by incorporating energy efficiency techniques, adaptive reuse strategies and use of Federal and State Historic Rehabilitation Tax Credits," said DiLorenzo. "Each year, we are impressed by the number and variety of laudable nominations, and this year was no exception. We are delighted to celebrate the rebirth of the historic Phoenix Brewery as the Phoenix Brewery Apartments, and to commend all members of the project team for their leadership and vision." Missed us on AM Buffalo this morning? Don't worry- we have a copy of Joseph Dorobiala and Todd Piotrowski's interview for you! They'll discuss our company culture and client experiences that have made us who we are for the past 16 years! 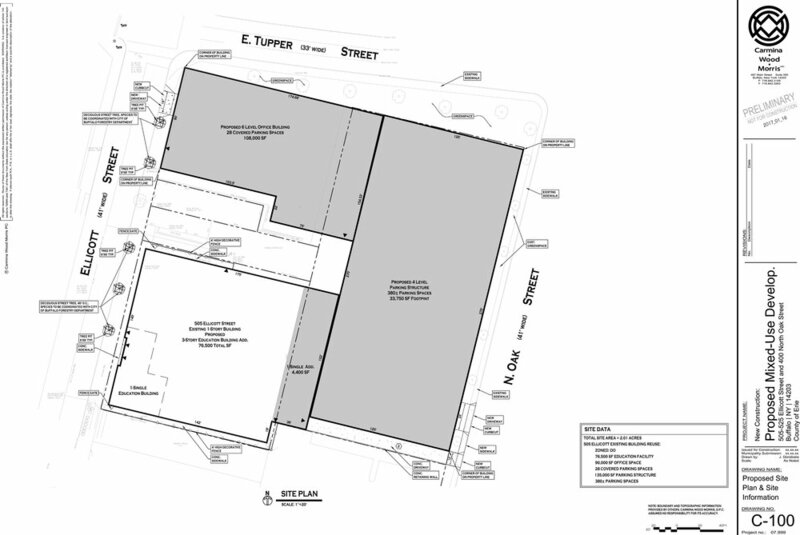 Following the standards of the newly-enacted Green Code, the plans for a new home for Buffalo City Mission are underway! Buffalo Business First details, here. "At 74,000-square-feet, the building is nearly double the size of the City Mission’s current 38,318-square-foot home base that sits on the same parcel. The larger size serves as a reflection of the Buffalo City Mission’s growing customer base and demands on the agency. CWM's partnership with People Inc. to convert the former Highland Elementary School in Tonawanda into 38 affordable apartments is almost complete! More information can be found in the latest Buffalo News article here! 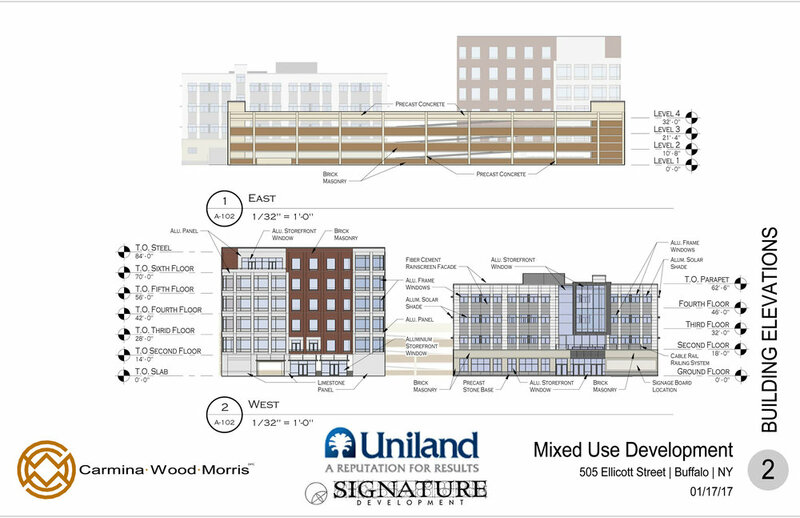 Buffalo Rising released the news today of our partnership with Rocco Termini and Uniland Development proposing a $70 million mixed-use development on Ellicott Street. We look forward to sharing our proposal with the school district! Our approach to this $30M project is to make it look to the pedestrian like a three-story building, and not a five-story building, by setting the top two floors back from the street and incorporating quality materials, classic architectural detailing, sufficient parking, green space, and environmental sustainability. The current plan is to create 57 high-end townhouse condominiums with ground-floor retail and parking hidden from view on the southeast block of Elmwood Ave, south of Forest Ave.
From The Buffalo News: "'The intent of this project is to bring people and vibrancy to an area of my neighborhood that has been sorely lacking for some time,' said Steven J. Ricca, a land use attorney at Bond Schoeneck & King, who represents Chason and also lives in the Elmwood Village. 'We're here to meet a demand that is undeniable.'" Watch this video to hear why the Elmwood Village needs this project!